the peregrinos that started coming from “beyond the Pyrenees” in the 12th century were overwhelmingly French, in part because of protection provided by the Kingdom of France. enterprising individuals followed the peregrinos from France and set up hospitals, hospices, inns, and other businesses catering to the needs of those trekking to Santiago. four separate routes originated in France –including the route we followed from St. Jean-Pied-de-Port, over the foothills and into Roncesvalles — and converged on Puente la Reina beyond Pamplona. for those walking “the whole way” St. Jean-Pied-de-Port is the most popular point of departure and head of the Camino Frances. plenty of people start in Roncesvalles or Pamplona instead, avoiding the arduous 1300m ascent (and descent) but coming from St. Jean affords a certain degree of pride and bragging rights. besides, after a climb that challenging and long when your body isn’t sure yet what you’ve gotten into you are prepared for anything over the next 775 or so kilometers. St. Jean-Pied-de-Port (St. Jean at the foot of the mountain pass), or Donibane Garazi in Euskara, lies about 8km over the French border straddling the Nive River. the area was settled before the 11th century and, after the destruction of the original settlement in 1127, the King of Navarre had the town reestablished in its present location to fortify the northern defenses of his territory. over the centuries, the location proved strategically important — as a stopping point on the Camino, a trade center, on the route through the mountain pass to Roncesvalles, a military outpost and garrison. the King built a fortress on a hill to make it easier to defend the pass and the town became a key urban center in northern Navarre and important defense against attempts to advance on Pamplona. in the early 16th century, the unification of Aragon and Castille (through the marriage of Ferdinand & Isabella) resulted in the defeat of the Kingdom of Navarre and, ultimately, closer ties with France in an effort to repel their mutual Spanish enemy. in 1620, Louis XIII (descended from Kings of Navarre) unified the Kingdoms of Navarre and France. as before, St. Jean proved a vital defensive component in the bitter rivalry between antagonistic kingdoms. advances in weapons technology resulted in a more “modern” fort, roughly similar to what exists today. over more than a century the structure was modified, fortified, and improved upon. the town suffered throughout the Revolutionary period and Napoleonic wars, serving as the center of a massive military encampment from which numerous attacks were launched on Spanish cities over the mountains. the town hosted a military garrison until 1920.
the main cobbled road through town retains many of the same features established in the middle ages. the Porte St-Jacques stands on the eastern end of the old town, while the Porte d’Espagne stands at the other. our hotel was one block over, outside the historic center in an area built up in the mid-to-late 19th century, spurred by the Enlightenment and construction of a train station in 1898. houses on along the rue de la Citadelle have changed little and some still bear markings from construction or inscriptions added centuries ago. because we arrived in St Jean late on Saturday evening, we had to wait until the Pilgrim Office in the rue de la Citadelle opened so that we might obtain our first sellos — stamps verifying we’d walked from St. Jean and were therefore entitled, as peregrinos, to stay in the aulbergue in Roncevalles. as we waited, we walked up the hill to the Port St-Jacques and took a peek at the Citadelle, duly impressed with the centuries of history surrounding us and knowing these streets and walls weren’t the oldest sights we’d encounter on our journey. I’ll start with a picture from our destination. after departing well before sunrise, using a headlamp to make our way through eucalyptus forest, getting lost for the first time on the entire journey, dodging ubiquitous city traffic, and getting stuck behind slow-moving, German day-trippers, we came through an archway, serenaded by a gaita (Galician bagpipes) and emerged into the Praza Obradoiro. 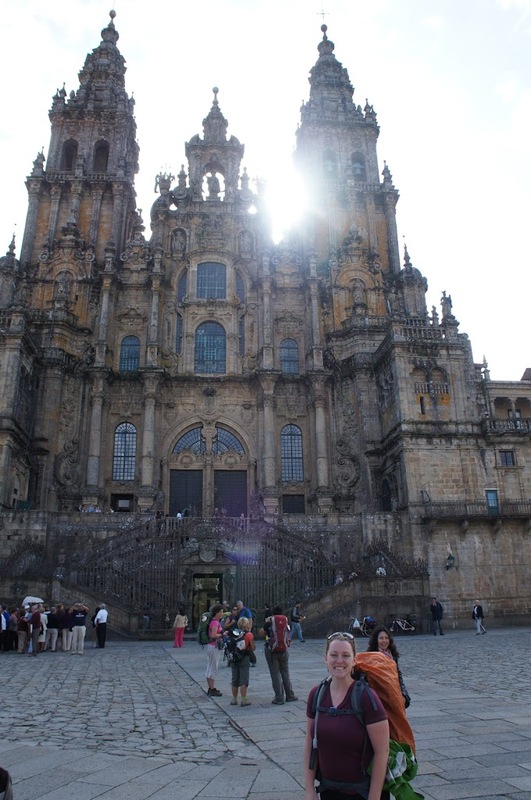 the hulking Ayuntamiento de Santiago (government building) filled one side of the plaza and facing it stood the expansive Catedral de Santiago de Compostela, backlit by the bright mid-morning sunshine. though the architecture of Burgos might seem more impressive from the outside or the stained glass of Leon more impressive inside, neither could compare in the elation that arose while standing in the middle of the plaza looking up at the place we’d traveled 500 miles on foot to reach. parts of the Camino certainly pre-date Christianity — Romans followed the light of the Milky Way along the route to the ocean; even after it became a Church-sanctioned pilgrimage to receive plenary indulgence, various routes (such as the Via de la Plata and the Camino Frances) served as major trading roads. the first recorded peregrinos from beyond the Pyrenees arrived in the 10th century and flow increased in the 12th century when Calixtus II started Compostelan Holy Years and had a guide published (the Codex Calixtinus which remains the foundation for many of the existing routes). infrastructure improved and the flow of peregrinos increased steadily until the Black Plague and political unrest throughout Europe in the 16th century cut down numbers. in 1985, fewer than 700 people arrived in Santiago as peregrinos but, following the Camino’s designation as both a European Cultural Route and a UNESCO World Heritage Site, numbers have increased steadily and exponentially. during the most recent Holy Year (2010) nearly of 280,000 peregrinos received Compostelas (the certificate of completion bestowed by the Church upon those who have walked the last 100km or biked the last 200km). to be certain — only a fraction of those travel along the route for the distance we trekked. we certainly met many people who did (several fond examples come to mind). on a given day we’d encounter between 20 and 50 other peregrinos, but not all of those intended to complete the whole route in one go. it’s fairly common for Europeans to do the route in three or more stages, breaking the trip up into more manageable chunks that still allow them to receive the Compostela upon conclusion. somewhat surprisingly, though, we also met more than a few people who’d hiked the Camino — from Roncesvalles or St. Jean — more than once. in light of the Camino’s popularity (and thanks, in part, I’m sure to Emilio Estevez’s “The Way”), numbers will surly grow as time progresses.